Many golfers throughout the Cleveland, Ohio and Canton, Ohio areas can attest to the fact that their short game suffers during the off-season. Since most courses suspend all operations mid-fall, it’s difficult for golfers to practice effectively until the following spring. To avoid skipping months of practice, a number of Akron, Ohio area residents have started to install artificial grass in the backyard, creating a private golf green that can be used year-round. 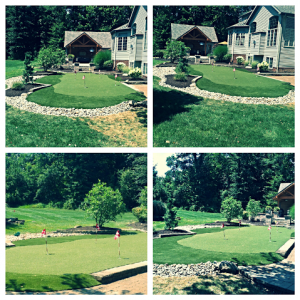 As an authorized distributor of SYNLawn’s real performing turf, SYNLawn of Northeast Ohio has become an excellent resource for those wanting a reliable putting surface on which to practice their short game. In fact, SYNLawn of Northeast Ohio has made it their mission to educate local golfers on the research and development behind their high-performance putting green, and how their product compares to the natural turf found on traditional golf courses. Though SYNLawn has always produced high-quality artificial grass with superior nylon fibers, the company went above and beyond when initially developing their putting surface. Though confident in their product line, their team knew that adjustments had to be made in order to mimic the look and feel of real performing turf. 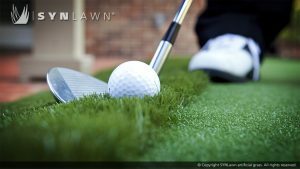 In a move that has benefitted golfers in Cleveland, Akron, Canton, and across the country, SYNLawn partnered with legendary golf coach Dave Pelz to test various aspects of their new golf product. To ensure that customers would get the same play on their own private golf green as a public course, SYNLawn and Pelz did a direct comparison between the two. The primary goal was to measure the ball reaction for putting, chipping, and approach shots using equipment and instrumentation designed by the Pelz Golf Institute. The resulting data was then analyzed by Dave Pelz and his team. After a year of testing, analysis, and development at SYNLawn’s state-of-the-art test facility at the Pelz Golf Institute in Austin, Texas, the company introduced their high-performance putting green to the market. Those who have had the opportunity to try SYNLawn’s putting surface have praised it as being the most realistic artificial grass option on the market. Since this real performing turf was designed to react like natural grass, golfers can look forward to perfecting their technique on private golf green whenever they have the opportunity. 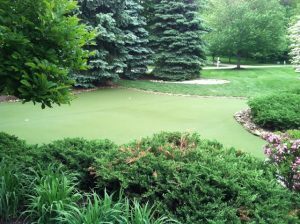 Avid golfers throughout the Cleveland, Ohio and Akron, Ohio areas can learn more about this high-performance putting green by visiting SYNLawn of Northeast Ohio’s website at www.synlawnneohio.com. 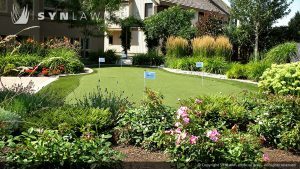 Information about how this artificial grass functions as real performing turf is readily available for those interested in investing in their own private putting green. Any additional questions about this putting surface not addressed on the website (installation, timeframe, pricing, etc.) can be directed to SYNLawn of Northeast Ohio’s staff by calling 330.492.8733. This entry was posted in Home Improvement, Landscape/Nursery, Lawncare/Landscaping, Synthetic Grass and tagged artificial grass Cleveland Akron Canton Ohio, high-performance putting green Cleveland Akron Canton Ohio, private putting green Cleveland Akron Canton Ohio, putting surface Cleveland Akron Canton Ohio, real performing turf Cleveland Akron Canton Ohio, SYNLawn of Northeast Ohio by admin. Bookmark the permalink.